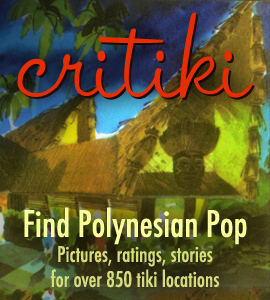 Many people turn to Critiki to help with trip planning: as soon as they hear they’ve got a business trip coming, or a vacation, they hit Critiki to look into their tiki bar options. And personally, one of my favorite things about going to tiki bars is meeting other tikiphiles when I’m on the road, especially if I’m in an unfamiliar town. I’ve long daydreamed about how Critiki can help make that happen, and today I’ve launched the first step in that direction, with a new feature: Upcoming Visits! Look for the “Add your upcoming visit” link on a location’s page (on the desktop, it’s on the right side, on a phone or tablet it’s right under the location ratings). Set the date you’ll be there, and share a short note describing your plans (e.g., what time you think you’ll be there, how long you’ll be staying, how to recognize you). You can also say whether this will be your first time visiting that location. Your upcoming visit will now be listed on the location’s page for all to see. All of your upcoming visits will also be listed on your public profile page, so that your friends can see what you’re planning. For now, it’s admittedly a bit like shouting into a void: there’s no way for a local tikiphile to communicate back to you that they’re game for meeting you there, and that person would have to happen to look at the location page to even see it in the first place. So, I’m planning on creating a way for locals to subscribe to notifications of people planning visits to nearby locations, and also some way for others to let you know they’ll be able to join you. But this new upcoming visits feature is a start! The upcoming visits section of the page for Tiki-Ti. If you’d like to take a look at how it works, I’ve just added some upcoming visits for my road trip to Mod Palm Springs next week. If all goes according to plan, I’m hoping to be at Tiki-Ti next Wednesday the 19th. Come raise a Ray’s Mistake with me! This is an awesome idea! I travel around the country checking out Tiki bars for my blog (tikiwithray.com). I will use this feature for sure! It would be cool to meet up with other Tikiphiles while traveling!